Noise Figure in full digital transmission, useful or dangerous? – We have moved – Follow us on www.telestehub.com! Noise Figure in full digital transmission, useful or dangerous? Take your favourite CD and switch on your CD player. Connect it directly to your audio amplifier and turn up the volume to its maximum. Everything works if the audio level in the amplifier input is relatively low but not too low. Measure the signal-to-noise ratio (SNR) of the amplifier input and output, their ratio is called Noise Figure (NF). NF tells us how an amplifier, audio or HFC, behaves in a particular setup. NF doesn’t tell us what happens if the input level of the amplifier is high and you still keep the maximum gain. In practice you hear/see distortion. NF ignores distortion although distortion is a real problem that must be considered. NF is pretty theoretical and more accurate options exist. 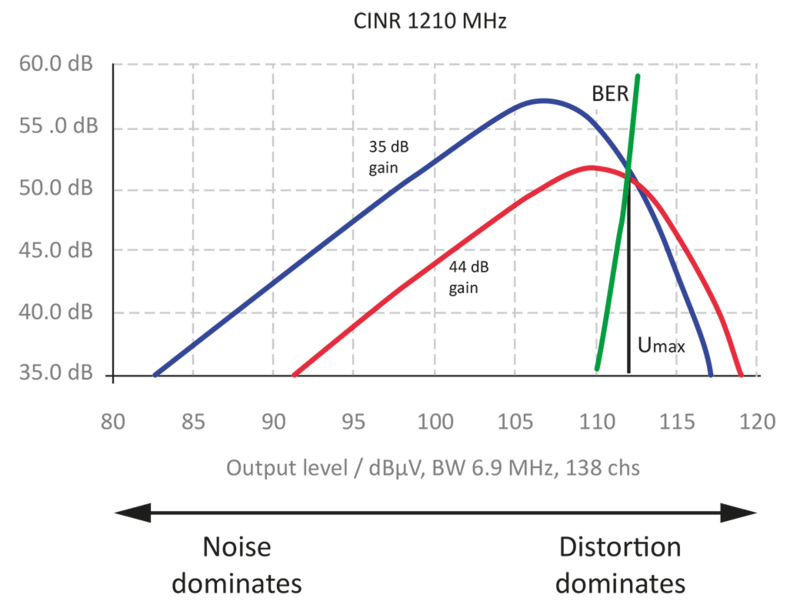 Carrier-to-Interference Noise Ratio (CINR) measurement takes distortion into account. Instead of a single value, it shows how an RF amplifier works when the input level is low, high or something between. The example figure below shows two ranges, a range where noise dominates although distortion exists and a range where distortion dominates although noise exists. Poor Bit Error Ratio (BER) is visible if the input level is really low and poor BER re-enters the game when distortion begins to dominate. Whatever happens in the network is secondary; in full digital transmission the BER is the only thing that matters for end customers. Therefore, specifications of wideband RF amplifiers should include CINR figures for up and downstream. Preferably up to 1218 MHz, and for more than one gain. Does this make NF useless? Not always. CINR figures cover NF and much more but CINR complicates network planning. In practice, many network planning, documentation and inventory tools use Noise Figure because it makes calculations easier. NF is just one value, unlike CINR, which varies in terms of the function of many parameters such as gain and the input level. Feeding many values in tools is laborious and modelling non-linear events, like distortion, is difficult. Are networks modelled based on NF erroneously designed? No, as long as all amplifiers in the network operate within a safe range and significant distortion problems do not exist. However, when HFC network design rules are pieced together, people behind rules should be aware of distortion. Noise figures are often measured in ideal conditions. Zero-input attenuation and max gain are often defaults. Methods of NF measurements should be reported; especially mid-stage gain and slope settings affect results a lot. Unreal settings may lead to surreal NF figures and, in practice, amplifier cascades are not behaving as expected. In these cases, measured CINR figures would help. Standard EN/IEC 60728-3-1 defines how active coaxial products should be measured; including CINR. Unfortunately, only some manufacturers follow guidelines. However, while NF, if measured and reported correctly, can be helpful, it might be dangerous if its limitations are ignored. CINR forces us to consider the limitations and offers visibility beyond NF.